The career path Griffin Jax figured in high school didn't include professional baseball. Jax, 24, who will take the mound Saturday night for the Pensacola Blue Wahoos against Jacksonville, has a history very different than his teammates. He's a 2nd Lieutenant in the U.S. Air Force after graduating from the Air Force Academy in 2016. "It's definitely been unique. Not your typical one, for sure," Jax said, laughing, when asked about his career path into baseball. Baseball wasn't even his main sport growing up. He was a soccer player at heart through his formative years in grade school and middle school. He briefly dabbled at quarterback in football, the sport his father Garth Jax starred at Florida State playing in the mid-1980's before a 10-season career as an NFL linebacker. "My mom and my grandmom were so against it from the start," Griffin Jax said about his brief foray in football. "And looking back, I'm glad they were. My dad is very fortunate to not have any serious injures being so removed now from football." Griffin was also interested in math and where that skill could take him. He calculated a potential future in a financial field when he accepted an invitation for appointment into the Air Force Academy. Service academies do not have athletic scholarships. "I chose the Air Force Academy essentially because it was super close to home. My parents live 45 minutes north of school in Colorado. Education was always super important to me, and you are not going to get a better education than one at a service academy. Playing D-1 baseball factored into it, and then just the life opportunities it gives you once you graduate." The late bloomer then blossomed. Professional scouts began showing interest in watching Jax pitch during his junior and senior years at Air Force. Though he didn't pitch much until his senior season, his talents on the mound began rapid development. He was viewed a rising talent by major league teams. But there was always a significant asterisk attached to his name. When attending a service academy, there is a required five-year commitment to serve upon graduation. Jax had every intention of honoring it. His father, grandfather, and uncle are military veterans. "I was still committed to the Air Force Academy and getting my education and serving," said Jax, who has fellow Air Force graduates as friends stationed at nearby Eglin Air Force Base. The Minnesota Twins chose him in the third round of the 2016 draft, despite the uncertainty of knowing when he could commit to baseball. 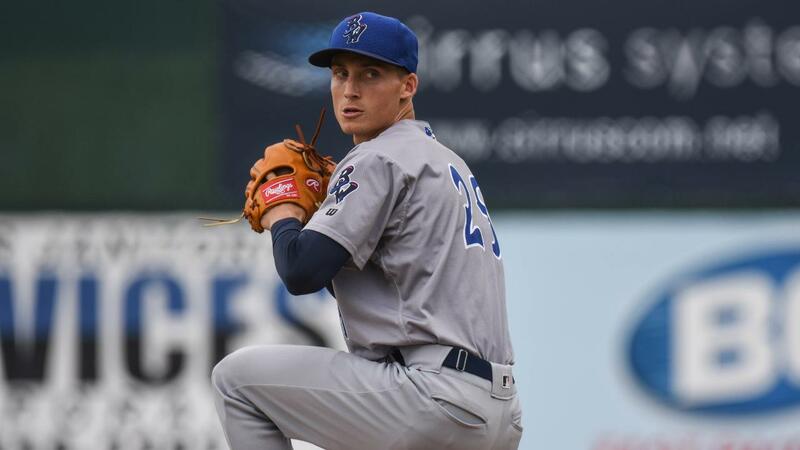 "They had the faith and trust in me that I would still be a good player no matter when that time would come," said Jax, whose first start April 6 in Mobile included five scoreless innings in an eventual 2-1 loss in extra innings. The breakthrough occurred when the Air Force permitted him to be part of newly created World Class Athlete Program in the military. It permits service member athletes with potential of representing the U.S. in an Olympic sport to immediately focus on their sport within two years of the Olympic Games. "When I graduated in 2017, I didn't think I would be realistically playing again until 2019, so it would have been this summer," Jax said. "Now that baseball was admitted back into the Olympics for the 2020 Games, I was able to enter the program and start playing baseball." He is now pushing toward becoming the first Air Force Academy graduate to reach the major leagues. The Twins have been thrilled by his progress the past 18 months. "What we see is a guy who is working hard to condense the time he lost and make up for it every day," said Blue Wahoos manager Ramon Borrego. "Since the first time we saw him, there has been a lot of improvement. His breaking ball has gotten a lot better. He always knew how to throw it, but he's learned how to locate that pitch when he needs to throw it." With Pensacola's wide connections with all branches of the military, Jax is aware of the outreach opportunities where he can contribute. He is planning to visit classmates and friends at the U.S. Air Force base at Eglin. "I do try and relate and be a figure for anybody in the military and show how awesome the military is for letting me do this," Jax said. "I have major respect for everyone in the armed services. My job is to help bring positive light to the Air Force, all branches of the military, the Blue Wahoos, and the Twins. "Any sort of outreach or recruitment opportunities that I can participate in, I will and I will try to bridge the gap in Pensacola between the baseball and the military community. Because I know how serious the area is with the whole military ties." After appearing in only 14 minor league games, beginning in 2016 with the Elizabethton Twins in the Appalachian League, Jax advanced from Cedar Rapids in 2017 to a full season in 2018 with the Fort Myers Miracle. He played a role in the Miracle winning the Florida State League championship. He compiled a 3-4 record and 3.70 earned run average. That led to the Twins choosing him to participate in the top-prospect laden Arizona Fall League. "Last year kinda helped reinforce the feeling that I do belong here," Jax said. "I always sort of had that chip on my shoulder. That feeling in the back of my head, that since I have taken so much time off, that I don't know if I could handle this anymore. "I was confident every time I went out on the mound and I never really doubted myself. So just playing a full season was awesome for me. And the Twins deemed me appropriate to represent them in the Arizona Fall League, which was just a huge sign of respect." The Twins know the military background Jax brings can easily benefit the disciplines required in professional baseball. "In the military, you have a regimen," Borrego said. "In baseball, we have rules to follow for their benefit. For a guy like Griffin, it's not hard for him to transfer that, because he knows how to act, he knows how to take care of himself, and he knows how to be responsible. "And in baseball, that is all we are asking for. Be on time, be responsible, be professional. And he's got all those traits."